I'm researching and getting the parts ready for a PFC in the 3rd Battalion/ 2nd Marines in the Battle of Tarawa in November 1943. What would be the appropriate uniform? Initially most of what I could find was green utilities and a helmet with a camo cover. Lately I seem to find more written that the 2nd Marines wore mostly the P42 camo uniform "brown side out" and the same camo cover on the helmet. The figure will be a gift for a fellow co-worker that showed me incredible details of his uncle, who was killed in the first day of the battle. The Tarawa and Bougainville campaigns in late 1943 saw the first widespread use of the USMC P42 camouflage uniforms. So many of the men on Tarawa wore the P42 camo uniform, with the brown side out. But photographs from Tarawa also show plenty of men wearing the green P41 utilities as well. Camouflage helmet covers are common, even on those who are wearing P41s, but there are even a few bare helmets still seen on Tarawa. Some men even mixed and matched items from the P41 and P42 uniforms, wearing green pants and camo shirt or vice-versa. 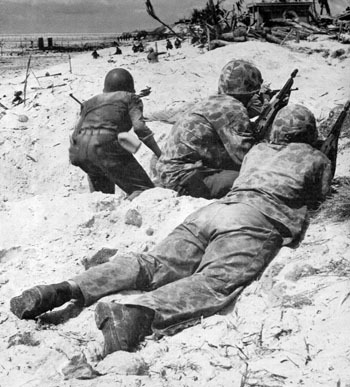 For example, here's a shot of three Marines on Tarawa, each wearing a different uniform. The man on the right wears the full P42 uniform with helmet cover. The man in the middle wears P41 pants with P42 shirt and helmet cover. And the man on the left wears the full P41 utilities and a bare helmet. Last edited by RogueJK; 12-15-2013 at 02:08 AM. It also seems that there were not many gaiters worn in Tarawa. I think I will go with the camo, brown side out for my figure. The Soldier Story figure of a Marine seems to have reversible P42 uniform, or at least printed on both sides. Can that uniform actually be used on either side? What about the helmet cover? Eduardo,the soldier story uniform can be used brown side or green side. The green side looks better, the brown side of the out fit is a little too dark and greenish. DML's Tarawa Sniper "Alan" has an excellent brown camo suit. DML also put out a brown sided shirt with one of their carded accessory sets. The DML brown helmet cover is my favourite. I think a really authentic Tarawa Marine look is the Brown side out helmet cover, brown side out shirt and sage green trousers. Keep the leggings but don't tuck and blouse the pant legs, just leave them over the leggings and maybe rolled up one or twice. Once you're done don't forget to post your pictures. I started getting parts together and checked my old boxed figures and found an Allan. I have several of thise uniforms loose and I like them a lot too. Like your idea of mixing in the green trousers. Too bad that I don't think I got extras of the helmet cover. I was wondering about the SS uni as the DML Allan is very nice, but not printed on both sides. Have seen the gaiter look you mention, with the trousers over tge gaiters. So they tied the gaiters to their bare legs? Sounds odd, but will go with that look. Initially I was going to go with a very weathered look, but since tge subject died on D Day, I think I will have him look as he was on the ship before transfering to the landing crafts. Another question on the weapons. My subject belonged to M Co. , the weapons company of the battalion, but I imagine many of the marines would wear tge basic equipment with ammi waistbelt and Garrand rifle. Might add a MG (30 cal) base or an ammo can. Eduardo, my first thought is that if he is in the Weapons company he's probably a member of a crew served weapon, mortars, MGs. If that is the case and he isn't actually carrying the mortar tube or the .30 cal MG then an M1 Carbine would serve well. Pistol belt with suspenders. Two canteens, but not the criss cross strap version, you will want the older style. For his back pack you would likely see the broken down One pack, not the double pack. He'd have an entrenching tool fastened to it and his shelter half (same colour side out to match his helmet and camo on his uniform. The K Bar knife was being issued and was replacing all other knives, but still wasn't universal. I'd still put one on his belt because to me that is a quintessentially Marine item. If you don't have a DML Brown side out helmet cover , let me know. I can probably spare one. Remeber a weapons Co would have the M1917 water cooled browning and not the M1919. So more crew per gun. I was watching a old U.S. army film on heavy weap co doctrine and in the army the weapon co was usually mounted in jeeps or weapon carriers as the equipment is really too heavy and. Cumbersome to be moved dismounted. This is still how D co (weapons co) are organized today in the army. I do not know if Marine weapon co would have been mounted on D-day or even on Tarawa as it was a tiny island, but I would assume the weapon co would have come in behind the rifle companies, maybe with the battalion command group. My grandfather who severed in a weapons PLT as a Mortar man says he hated the M1 carbine and would throw it away for a garand when ever he got a chance. I know you couldn't pay me a million dollars to carry a M1 carbine into combat. Great stuff guys, very helpful. I was thinking of having him carry the tripod of the water cooled MG. Would they have this strapped somehow on the back or just carry it with their hands? I'm all set with the brown side out helmet for this one guy, but the shelter half, did DML produce it in one of their figures. The one I have is green side out, from Jake ( I think). I had the double pack and ammo belt ready, but will save it for a future figure.\Will change to a simple belt with the pistol and the two canteens, had decided to go with the earlier style without the crossed straps. 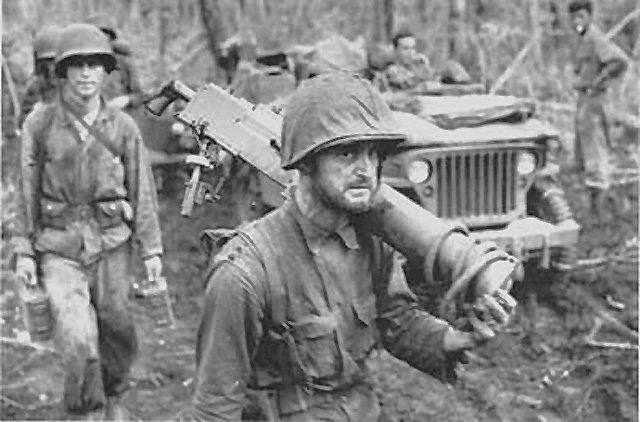 M Co. of the 3/2nd Marines arrived in the first wave on LVTs reaching the area of Red Beach 1, known as the "Bird's Beak", around 0910. He had arrived in the area on the USS Arthur Middleton, APA-2577. Last edited by egonzinc; 12-15-2013 at 05:17 PM. Yes. Unfortunately, it only came with two hard-to-find sets, the USMC Infantry Equipment Set 2 and the Iwo Jima "Uncommon Valor" set. You may have to go with either the DML green-side-out shelter half, or the one from Soldier Story (even though the camo patterns won't match exactly). Last edited by RogueJK; 12-15-2013 at 05:56 PM. The Soldier Story reversible uniform suffers from the fact that the seams are finished nicely only when worn green side out. The helmet cover is the same way. The helmet cover from Soldier Story's Iwo Jima marine is, however, very nice. The DML and maybe Battlegear toys brown camo uniforms are my favorites. That's not a shelter half, its a camoflauge poncho. You see a lot of these at Tarawa. Do not mix green side and brown side camo, it is the ultimate Marine No-no. For his back pack you would likely see the broken down One pack, not the double pack. He'd have an entrenching tool fastened to it and his shelter half (same colour side out to match his helmet and camo on his uniform. Good reply Tim. Technically, the upper portion is a haversack and the lower section is a knapsack. (Useless trivia, I know). 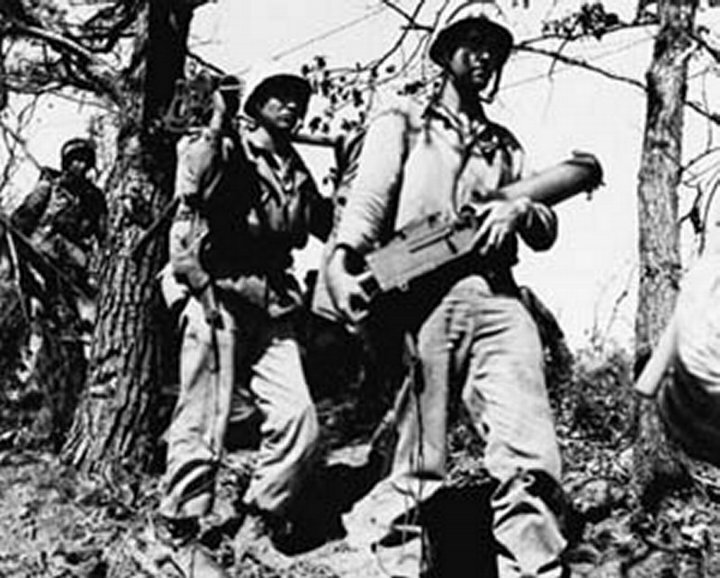 There were basically five configurations of the M1941 pack system. -light marching pack, for short combat operations. Basically just the haversack, no belt suspender straps, no bedroll, usually an entrenching tool. This is the most common configuration that would be seen at Tarawa. -marching pack, haversack, belt suspender straps, cartridge belt, e-tool, no bedroll. Used when there will not be the need to bivouac. -field marching pack, haversack, belt suspender straps, cartridge belt, e-tool, short bedroll. Used when you will bivouac. -transport pack, used when you need to carry all your personal gear issue but are not expected to bivouac. Haversack, knapsack, belt suspender straps, cartridge belt, no bedroll. Normally no E-tool attached. Not normally a combat pack. Long moves, where there is no need to bivouac is where this is most commonly seen. However, personnel that have a need to carry additional equipment, (such as someone in a weapons company) that needs to carry extra equipment for their crew served, might carry this, extra barrel mitts, tools, mg spare parts,etc. -field transport pack, same as the transport pack but with lond bedroll and e-tool. Used when you will bivouac and expect to be in the field and extended period. IIRC, the short bedroll had your shelter half, 5 tent pegs, three tent pole sections, a blanket and your guy line. The long bedroll had the same and a second blanket. As for your heavy machine gunners in the weapons Co. they normally humped their gear. Here's a couple pics for reference. The gunner normally humped the gun and the A-gunner the tripod and T&E mechanism. The 1st Marine is the gunner the one behind him one of the ammo bearers/security men. In this case the T&E mechanism is still attached to the gun. Front Marine is probably the gunner, the second Marine the A-gunner with the tripod. They would swap out on a longer movement to give each other a break. The front Marine had the tripod and cradle, the second Marine the gun. The front Marine is wearing leggings with his trousers out as Tim described. Last edited by USMCPrice; 12-18-2013 at 12:25 AM. 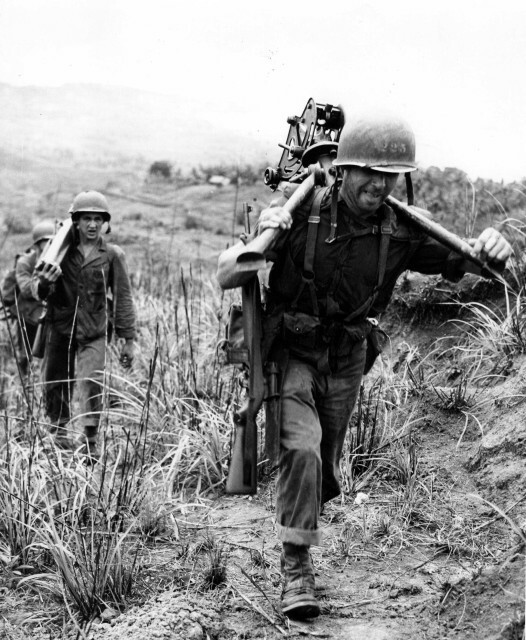 So for Tarawa you recommend the #1-light marching pack with no suspenders. Would this also be the dase for a soldier in a rifle company that had a cartridge belt on his waist? On the rolling the trousers, it would look odd as the inside should be the opposite camo color and the Allan troysers or BGT brown side out are not green side out inside. So is the item around the haversack a poncho or a half shelter? Yes, for the majority of the troops, but you can mix in some transport packs for personnel that might be carrying extra equipment. They did not anticipate there would be the need to bivouac so the shelter half/blanket rolls were not specified to be carried. During the assault phase you don't use tents. You may make a lean to to keep the sun off you if not moving, using the poncho and when sleeping just curl up and sleep in your fighting position or at the most wrap up in the poncho like this Marine on Iwo Jima, (you do see blanket rolls at Iwo because the weather was cold at times, hence the field jackets also, plus they expected from the get go that the operation would take more time and units would be pulled off the line and bivouaced. Tarawa was close to the equator and the weather hot). Would this also be the case for a soldier in a rifle company that had a cartridge belt on his waist? You can go either way. (and it's Marine not soldier, another Marine pet peeve ). Generally speaking it was more common to use the belt suspender straps if wearing the rifle cartridge belt. The way the pack was rigged the pack and cartridge belt could be jettisoned quickly as one unit, if the Marine went into the water. The rifle or pistol belt (similar but the webbing used is heavier in the rifle belt) also ride differently than the cartridge belt. The cartridge belt is more comfortable when used with the belt suspender straps and the rifle/pistol belts without. Yes, you're right. It depends on the uniform manufacturer. I like the Alan uniform but it only replicates the brown side camo, and does not have the green, reversable side. If you have some of your figures using the camo blouse with plain green utility tousers, you can roll the legs. You see a lot of mix and match uniform parts. There are also a good number of pictures showing the khaki service shirt worn with the camo or green utility trousers, however this is much less common than the mixing of the green and camo utilities. It is the shelter half/blanket roll. You often see the poncho folded and carried under the haversack flap, rolled and carried under the straps on the bottom of the haversack or draped over and through the belt in the rear. In the 1/6 version mentioned earlier it is easy to tell it is the poncho because of the head hole and small collar. Here's an example of the folded poncho under the haversack flap and straps. Here's a picture of a few of the mix and match uniform part variations. Also, note the use of ponchos to form a lean to at the lower left. You can still find the Dragon USMC Infantry Equipment Set 2. The poncho is really a pretty nice replica of the real thing. If you'll notice in the attached picture you can see the small collar around the head hole. Thanks again for the great information. Should have come back to the post before spending about an hour on the shelter half/blanket roll piece... I'll have see now if I can safely remove it! On the rolling of the trousers, not sure what got into me, as I had already decided to use the camo trousers for the shelter half and to use green trousers, rolled up. They turned out nice, with the gaiters, more work, but useful as otherwise the trousers would have been too long and not sure what I would have done. My project is of a particular marine, who died in Betio on D Day and was 67.3 inches tall, about 5"6". I think one technique that would work is doing something similar to what I do sometimes on FJ tunics and regular German shirts wit rolled up sleeves. I cut the sleeve and use the nicer exterior(usually inside some 1/6 tunics the color is completely different). SO on the trousers, if they were camo, I can make a roll up of green side out and glue it on the end of shortened brown side out trousers leg ends. That I think would look very nice, although would sacrifice a pair of green side out trousers to achieve the look. I'm really enjoying this project. As it always happens on a gift project, I'm sure I will want to make one for my collection later on. Second one is usually easier! Last edited by egonzinc; 12-22-2013 at 06:52 AM.